The themes presented in this chapter illuminate the theme of changing the physical foundations of landscape in their social interpretation and evaluation (here interpreted from the perspective of social constructivism). 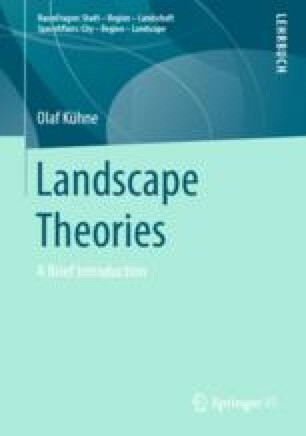 It becomes clear that this interpretation and evaluation of the changes in the physical foundations of landscape is by no means carried out on a uniform social aesthetic or moral basis (even the ontological question of what exists is not uniformly understood in the context of changes in physical space). Conflicts over landscape (as well as other conflicts) often arise from the question of what is ‘normal’, whether aesthetic, moral, domestic, or whatever. A reflection upon the question of on what basis—aesthetic, moral, ‘Heimat’, etc.—the assessments are made is a first step towards conflict regulation, because it is an essential precondition for recognising alternative world interpretations. A greater tolerance towards ‘ambiguous’ and ‘hybrid’ spatial developments seems quite opportune in view of postmodern spatial developments. With the diversity of lifestyles, cultural mixes, the interpenetration of work and leisure, etc., the differentiation of spatial demands is also increasing. To pursue a restrictive and unambiguous spatial development strategy for administrative purposes seems unlikely to be successful.